One way to get people to eat more spinach is to serve spanakopita, the delicious Greek feta-and-spinach pastry in flaky phyllo (also spelled fillo or filo) dough. While spanakopita is typically layered in a large pan from which individual servings are cut, it can be rolled into individual triangles—more elegant but more labor intensive. In Greece, spanakopita is usually eaten as a snack. In the U.S., it makes an attractive first course, a light lunch with a salad or a dinner entrée for vegetarians. Because it can be enjoyed warm or at room temperature, we like to serve spanakopita at parties, picnics and cook-outs as well. We’re making a tray of it as our contribution to upcoming Memorial Day festivities. 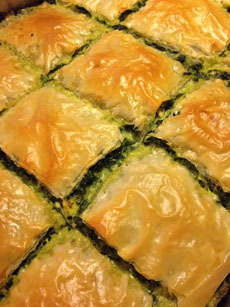 Spanakopita is one of our favorite ways to enjoy spinach. Photo courtesy Kontos Foods. Delicious party, picnic and cook-out fare. 1. MIX together the spinach, feta, dill, parsley, leeks, eggs, salt and pepper. 2. BRUSH the bottom of an 8×8-inch baking pan with olive oil. 3. PLACE a sheet of phyllo in the pan; brush lightly with olive oil. Use kitchen scissors to trim the phyllo to fit. Repeat until you have 6 layers, lightly brushing each layer with olive oil. 4. 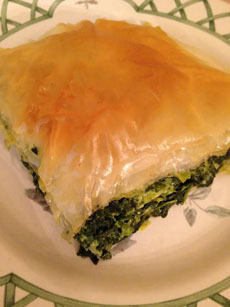 PLACE the spinach and greens mixture on top of the 6 layers of phyllo, in an even layer. Flatten with a spatula. To create a “top” for the spinach pie, layer another six pieces of phyllo on top of the spinach mixture, brushing each layer with olive oil as you go. 5. BAKE for 30-50 minutes at 350°F, until golden brown. Add chopped hard-boiled eggs to the filling. Use puff pastry instead of phyllo. Use kale instead of spinach, or a mixture; or a combination of spinach, leeks, chard and sorrel (a blend that is popular in rural Greece). Subsitute tofu instead of feta for a vegan filling. Spanakopita (spa-na-KOE-pee-tah), a Greek savory snack pastry, is a member of the burek family of savory baked or fried filled pastries. The name means spinach pie. Burek pastries are typically made with paper-thin phyllo dough or a thicker, calzone-like dough. They can also be made with puff pastry. The pastries are filled with cheese, egg, minced meat or vegetables. This style of pastry is believed to have been invented in the early era of the Ottoman Empire (1299-1922), in what is now modern Turkey.